Parrots moving to Park Slope? 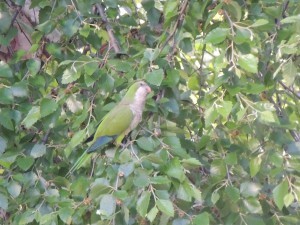 Monk parrot hanging out in Park Slope. This picture would have been better if he was at PS321 or a stoop sale. About a year ago some monk parrots discovered someone feeding birds on the roof of their brownstone on Third Street, near Seventh Avenue, my neighbors tell me. Now the birds are flocking to a tree on the corner of 3rd Street and 8th Avenue. Not building a nest, mind you, but they’ve been hanging around. (When I was looking and pointing at them, talking them up to passerby, a woman from the building across the street came down to talk to us about the parrots. She says they’ve been in that tree for five days. Another birder says they’ve been hanging around the Beth Elohim Temple a few blocks away. In maybe 15 minutes I saw at least five birds. There are big colonies at nearby Greenwood Cemetery and Brooklyn College and all around the boroughs–and for that matter the US. Brooklyn Parrots keeps track and gives great tours (the next one is June 2) of the flocks, tracking the mystery of their appearance. The general theory is that they escaped from an airport shipment, but the problem is, this cartoonish shipping crate mishap is cited wherever the parrots live around the country. Neighbors of the bird feeder were not at all delighted, like people usually are, with exotic green birds flying around their neighborhood. They were annoyed with the screeching. I pretended not to know that there are some people out there who hate the parrots and just celebrated their arrival with enthusiasm.